There’s this adorable restaurant over in Jersey called the Pop Shop that makes amazing food and they have a huge section on their menu just for grilled cheese. 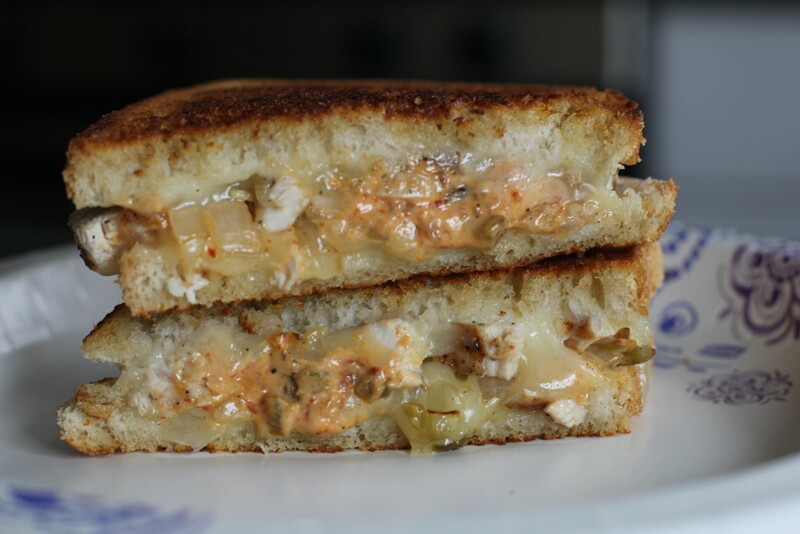 One day I tried what they call their Frazer Grilled Cheese – it’s a griddled chicken breast with Monterey Jack cheese, jalapeno-onion relish, and chipotle mayo. I’ll never forget the first time I ate this grilled cheese – it was so spicy, it was painful, but I couldn’t stop eating it. It was so amazingly delicious. I only had one complaint about it, but it never prevented me from ordering it – the chicken was sometimes too tough to bite through. It wasn’t cooked terribly, I think it was just the nature of how it was cooked – it wasn’t grilled, I think it was slapped on a griddle and sandwiched with a press to cook it quickly. So I was expressing this complaint to a friend of mine one day and she said, “Well you should just try to make it yourself, maybe you can do it better.” LIGHTBULB. I don’t know why I hadn’t ever thought of that before. And so my wheels started turning. Any grilled cheese worth its salt starts with amazing bread. I had a firm sourdough in mind for this. Then there’s the matter of the chicken. I decided to keep it basic since I knew the chipotle mayo would be imparting lots of flavor. A simple dusting of salt and pepper should do. Next: the jalapeno-onion relish. I wasn’t sure what was in it other than jalapenos and onions. I thought there was no way it could be that simple. So I figured – what the heck, add some garlic. Turns out, my first pass at this recipe with garlic in the jalapeno-onion relish was very good, but the garlic was too strong. And it wasn’t exactly the flavor I was looking for with this sandwich. So maybe it really was as simple as jalapenos and onions. But if you’re a garlic lover, go ahead and add a couple cloves of minced or grated garlic to the jalapeno-onion relish and you’ll be a happy camper! Chipotle mayo. Easy. I already had a favorite recipe. When the sandwich came together, the result was so amazing, and so much better than what I had at the Pop Shop (no offense, I still love you guys, and I’m still a very loyal customer). I hope you guys like this sandwich as much as I do! If you like spicy but not too much of it, eliminate the jalapeno-onion relish. This sandwich still has plenty of kick with just the chipotle mayo. 1. Prep your bread: Lay your bread out on the counter on slices of paper towel, and spread one side of each slice with 1 tablespoon of butter. 2. Grill your chicken: Pound your chicken breast(s) out to an even thickness and season generously with salt and pepper. Grill over medium to medium-high heat for 3-4 minutes per side. Chicken is finished cooking when an internal thermometer reaches 165 degrees F. When the chicken is finished, remove from the grill and dice to desired size (I prefer big chunks of chicken). Divide into two equal portions. Set aside until ready to assemble sandwiches. 3. Make your jalapeno-onion relish: Spray a small nonstick skillet with a couple sprays of nonstick cooking spray. Heat skillet over medium heat and add the diced jalapenos and onions. Saute gently until onion begins to soften and turn translucent. Turn heat to low to keep warm. You don’t need to caramelize the onions, only soften them. 4. Make your sandwiches: Heat a nonstick griddle or skillet over medium heat. Place one buttered slice of sourdough butter-side down into the pan. 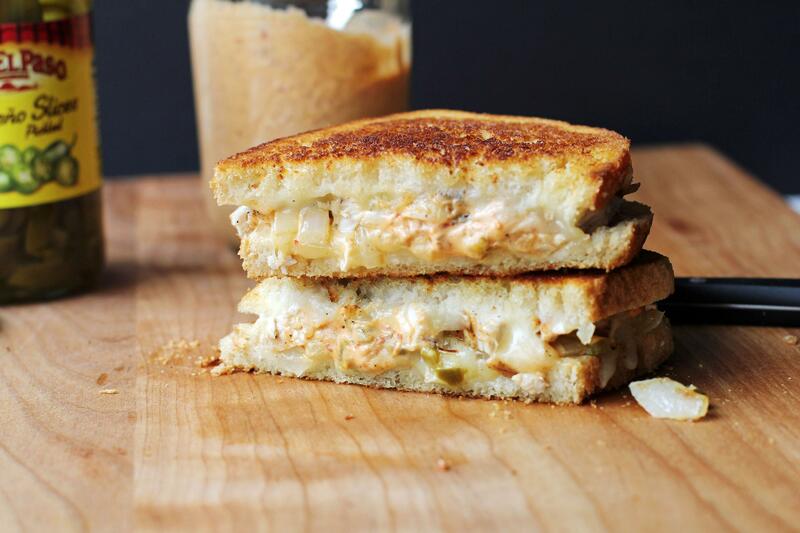 To build the sandwich, layer one portion of shredded cheese, one portion of diced chicken, and half of the jalapeno-onion relish. Drizzle with as much chipotle mayo as you desire. Top with another portion of shredded cheese, and another slice of buttered sourdough, butter-side up. Cook the sandwich for 3-5 minutes, until the cheese starts to melt and it’s ready to flip. Check the bottom slice of bread for brownness before flipping – you want it to be a nice golden brown before flipping. Flip carefully, holding the top slice of bread in place if needed. Continue to cook on the other side for 3-5 minutes, until all the cheese is melted and both sides of bread are beautifully golden. Repeat with the other sandwich.